CORNWALL – Local parents of children fighting cancer are urging residents to show their support by decorating their homes and businesses in gold for September. 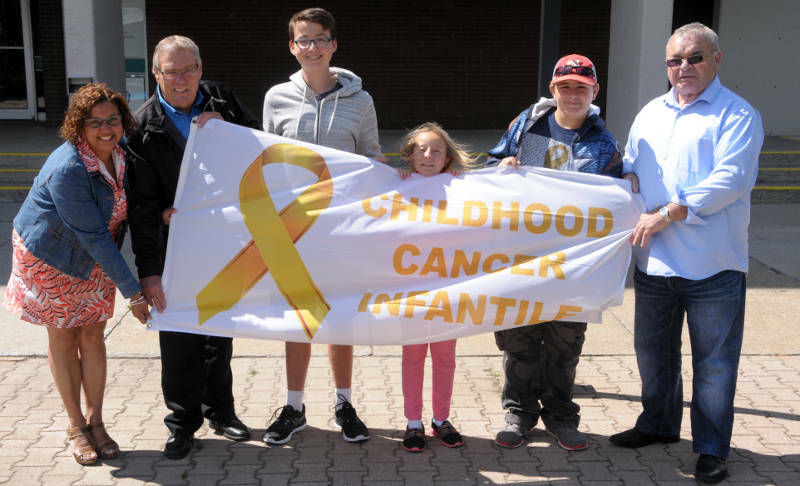 Dignitaries raised the Childhood Cancer Awareness Month flag outside the justice building on Pitt Street Friday afternoon. Also at the event were 12-year-old Madison Primeau, 14-year-old Sean Cowan and their parents. Madison was diagnosed with brain cancer while Sean is getting treatments for leukemia. But, meeting them, you wouldn’t have known about their challenges given with their bright and outgoing personalities. Cheryl Tourangeau, whose 14-year-old son Alex was diagnosed with leukemia four years ago, told Cornwall Newswatch childhood cancer is not rare and can happen to anyone. “Trust me, from it happening to us, it can happen to anyone. Cancer does not discriminate for age or gender or religion or anything. I wasn’t a cancer mom until the 13th of July 2013 (when) I got told that your son has cancer. It changes your life totally. 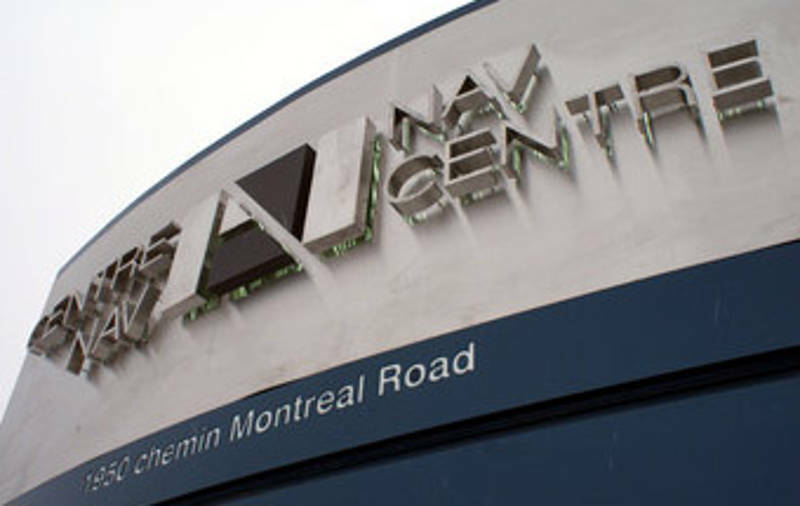 It changes their lives totally,” Tourangeau said. According to Childhood Cancer Canada, around 1,400 children are diagnosed every year in this country. She said it’s especially hard on children, who are taking reduced doses of adult chemotherapy drugs. “The treatment that they go through is brutal. It’s painful. It’s causes them nausea and causes them a lot of anxiety. About six weeks in (to treatment), it took six adults to hold Alex down to have any blood work done or his (chemo) port accessed,” Tourangeau said. “Nothing is harder on a parent than having your child look at you in the eyes and say ‘Don’t let them do this make them stop’, when you know he has to be accessed or he has to have the blood drawn and he’s crying and you’re crying. It’s traumatic,” she said. Alex finished his treatments in November 2016 after 1,152 chemotherapy doses, 10 sessions of cranial radiation, 27 lumbar punctures and 19 blood transfusions. “But he was one of the lucky ones. He got to ring the bell. During our journey, we lost a lot of very good friends, who didn’t make it to the end of treatment. And that makes this month extra difficult. As much as I’m grateful that Maddie, Sean and Alex are here, I think about the friends we lost along the way like…Little Alex the Warrior, who are kids from Cornwall who didn’t make it,” she said. 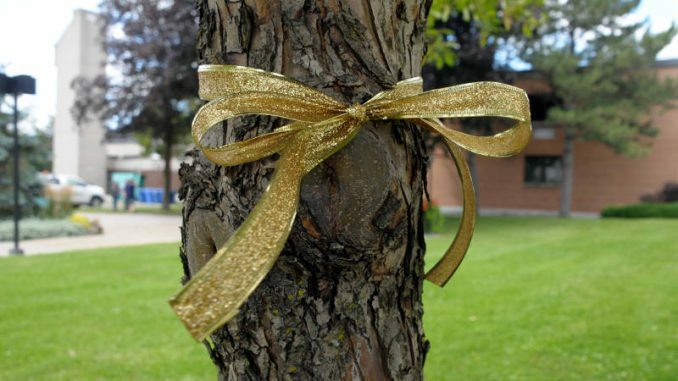 As for activities happening this month, gold ribbons are adorning trees in the two downtown areas, while gold pins and magnetic ribbons are available at Life’s Little Pleasures with a minimum donation ($2 for pins, $5 for ribbons). The pin money is going to Candlelighters, a non-profit children’s cancer support group, while the ribbon money is going to raise awareness. 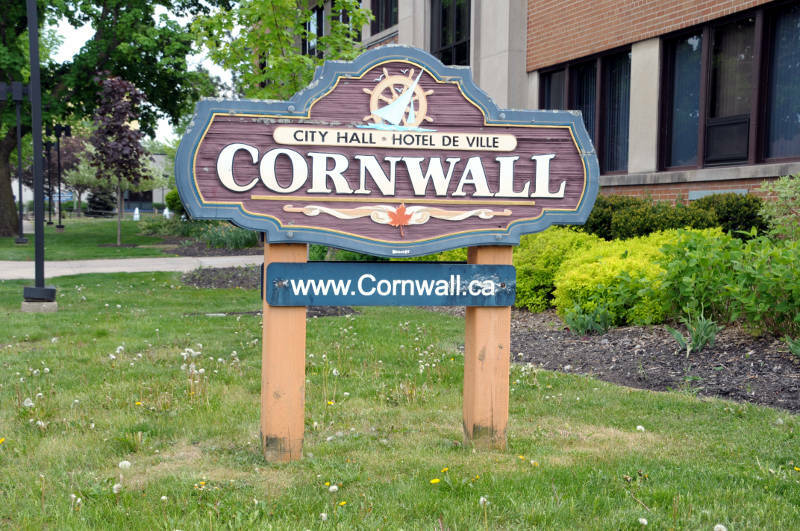 Tourangeau is also encouraging people to decorate their homes and businesses in gold and post pictures on the Paint Cornwall Gold Facebook page. The Lamoureux Park clock tower will also be lit in gold for September and the Pommier Parkade is also decorated.